Healthcare.gov is the premier website through which you can buy Obamacare health plans. The site’s application can be completed in less than 30 minutes and a plan can be chosen in seconds. Heatlhcare.gov is the website through which you can sign up for Obamacare/ACA health insurance plans available to those who aren’t eligible for Medicaid, Medicare, CHIP or can get health insurance through their employer. The website is unique in that it is the one site through which you, as an individual, can buy health insurance directly from providers without working through a middle-man, whether it be someone who sells health insurance or a website that helps you pick a plan. Healthcare.gov was launched in 2013 after the signing of the Affordable Care Act, a massive piece of legislation that brought big changes to health insurance in the United States. One of those changes was the creation of a healthcare marketplace where you could pick health and dental plans each year to cover you and your family in the event that you couldn’t get health insurance from your job. The site has received praise and criticism over the past few years but, for many people, it’s a necessity they have to navigate each year in order to find health insurance. In our review, we will talk to you about how the site works and how it compares to other sites that act as a middle-man and help you navigate what can be a confusing process. Along the way, I will interject my own perspective as someone who buys his health insurance through Healthcare.gov. Because this site is run by the government and they’re using their criteria to determine which plans are available in your area and what kind of subsidies you’ll get, you’ll have to provide them with all your information up front because you can see the plans available to you. The application, while lengthy, isn’t too in depth. Give yourself about 30 minutes to complete it. What’s nice about the site is that, once your application is complete, not only can you see the plans available to you but you can also leave the site and come back at a later date to check plans again. This is an advantage because it allows you to download information about the plans you’re interested in, research the info and make an informed decision. As you fill out your application, the site will ask you your address, your age/gender and the ages/gender of other people in your family who will share your plan with you. The site will also ask you for your income. This section is very important because your income and your family size, as well as your location, will dictate how much of a subsidy you get. In this case, a “subsidy” is the portion of your premium the government will pay. As you move through your application, you’ll come to a point where the site will tell you what your monthly subsidy is and give you the ability to choose how much of that subsidy you want to use. You can use all of it, some of it or none of it. If you choose not to use all the subsidy every month, there’s a good chance (if you provide an accurate income estimation) that the government will pay those subsidies back to you when you file your taxes. In the event that you underestimate your income, you may have to pay back the subsidies you used because you were given more of a monthly discount than you should’ve received. You can do a preliminary check of how much your subsidy might be by using the subsidy calculator that the Kaiser Family Foundation provides. I used the tool and the monthly subsidy it calculated was identical to what Healthcare.gov calculated. Once you move past the subsidy section, you’ll have to answer a question about whether or not you’re a tobacco user. According to the site’s fine print, a smoker is someone who averages four smokes a day for the past six months. The fine print notes that answering “Yes” to the smoker question could increase your premiums (monthly payments) by as much as 50%. As you finalize your health insurance application, the site will ask you if you have any preferred doctors, hospitals and/or prescriptions. This is an important part of the application because this is how you can check if the current doctors, hospitals and prescriptions you use will be covered by the plan you choose. You’ll answer a few more questions and then have a chance to pick your plan. When you click “Quick View”, the plan will expand to provide you with more information as well as a list of the preferred doctors, hospitals and prescriptions and whether or not they’re covered. “Metal level” refers to how much of your expenses the plan will cover once you meet the deductible, which is the amount of money you have to pay out of pocket to get the full benefits of the plan. Bronze plans cover 60 percent of expenses, Silver covers 70 percent and Gold covers 80%. In most cases, Bronze plans will have much higher deductibles than Silver and Gold plans … think $6,500 instead of, say, $4,000 and $3,000. Also, plans with higher premiums tend to have lower deductibles. Each of these types of care has a co-pay, which is the money you’ll pay out of pocket for a visit or prescription. Some of the bronze plans you’ll see will note that there is no co-pay for these services once you hit your deductible. What this means is that you’ll pay full price for your visit to a doctor, specialist, ER or for a prescription until you’ve met your deductible. One final pointer as you compare plans: Urgent care prices are included in the “Quick Details” section of each plan. As you consider which plan you’ll get, remember that you should read through all the plan’s details: how much the hospital stays will cost, how much mental health visits are, what the projected cost of a normal pregnancy and other procedures that might be pertinent to your health. Once you’ve chosen your plan, you’ll have to pay your first premium on or before Jan. 1, in most cases, in order to activate the insurance. The final step you have to take is choosing a dental plan. In some cases, your health insurance will cover basic dental services but, in most cases, it won’t. 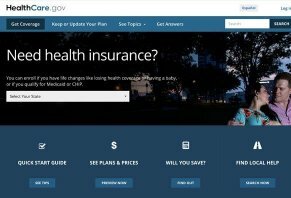 Pro tip: Unless you have a change in family size or income, the last day you can sign up for a plan is Dec. 15. Healthcare.gov is the premier source of information about your health insurance plans. What this means is that all other sites that help you sign up for plans use the information that Healthcare.gove provides. With that in mind, we want to do a quick comparison between the site and two other sites that offer to help you choose a marketplace plan: HealthSherpa and eHealth. What makes these sites different than Healthcare.gov is that they focus their preliminary questions on location, family size, age, and income. Because of this, they can provide health insurance quotes far quicker than Healthcare.gov can. Another point of differentiation is that health will help you sign up for a plan via a phone representative, whereas HealthSherpa will redirect you to the Healthcare.gov website. Based on our experience, we believe that HealthSherpa and eHealth have more user-friendly sites and are less intimidating than Healthcare.gov. Their explanations of technical insurance terms will be a relief if you feel overwhelmed by the health insurance sign-up process. However, if you’re the kind of person who isn’t intimidated by health insurance terminology, then Helathcare.gov is a great site. While the explanations they provide for various terms and requirements aren’t quite as colloquial as what you’ll find on the other sites, they are sufficient. The one important thing to remember is that HelathSherpa and eHealth cannot give you better prices than what you’ll find on Healthcare.gov because Healthcare.gov sets the prices, plan options and subsidies. Pro tip: You can use insurance brokers to find you marketplace plans as well as plans from ACA-compatible insurance plans not available on the marketplace. We believe that Healthcare.gov is a viable option for buying health insurance from the healthcare marketplace, considering that it’s one of the few places you can go to buy health insurance from the healthcare marketplace. Really, the decision comes down to two things: your own learning style and your understanding of the marketplace. If you’re a visual person, then using a combination of HealthSherpa and Healthcare.gov is a good choice because you’re able to compare plans and see where they’re similar and where they differ. However, if you understand things better when someone verbally explains them to you, then a site like eHealthInsurance.com may be the best fit because, once you choose a plan in which you’re interested, you can call them and finish the application over the phone. Keep in mind, though, that Healthcare.gov’s customer service line has been very helpful the multiple times that I’ve called in with questions about the website and various other things. In general, the website is informative and the application is easy to fill out. If you have any questions during your application or when it comes time to choose a health insurance plan, you can call their customer service line at 1-800-318-2596. I spoke with a supervisor, he said my income qualified me for the Premium tax credit and as long as it didn't change then I should be good, I was able to send in the documentation to the IRS, but the ACTUAL PROBLEM is still not solved. I'm very upset that this happened. They need to do written verification before signing anyone up for insurance because I still owe Cigna like $116.00 and I wasn't even aware of it. I'm not paying it. I was able to speak with a supervisor and he told me that my income still qualified me for the Premium Tax credit, and as long as my income reported remained the same then I shouldn't owe anything. So I sent in the needed information to the IRS and we will see if that supervisor was indeed correct, but this shouldn't have happened in the first place. They should need written verification before enrolling anyone, especially since it's very easy to sign up without actually knowing you did. I'm still very unhappy, but I'm relieved to possibly have the tax situation handled. I was looking up information online, and was really interested at first because I was paying a lot for my work insurance. I was close to finishing the enrollment, but I still had a few more questions before I did, so I called a rep. I didn't give her any information about me, but I asked if she thinks I would still qualify for the Premium Tax credit. I described my situation and she said, unfortunately, since I already had work provided insurance that I wouldn't qualify. So I was like okay, and didn't go any further with enrolling. It's a year later and I get a notice from the IRS after filing my tax return that the marketplace is wanting to take my refund. I somehow was enrolled with get this PREMIUM TAX CREDIT I DON'T QUALIFY FOR and now I owe them because they have been paying Cigna on my behalf. I have tried getting this problem resolved and no one is helping me, instead, I get generic excuses and rude customer service. Write a Review for HealthCare.gov!